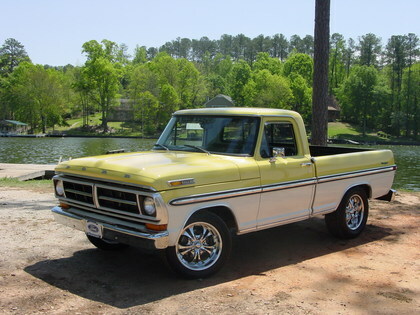 Home Ford Trucks 1971 F100 Yellow & White – Just Right! We came across this 1971 Ford F100 in Georgia awhile back and thought it would make a perfect addition to our Friday Ride of the Day. This truck is a good example of a resto-mod with an emphasis on resto. The owner did the right updates to improve the truck, but not change the original F100 that much.